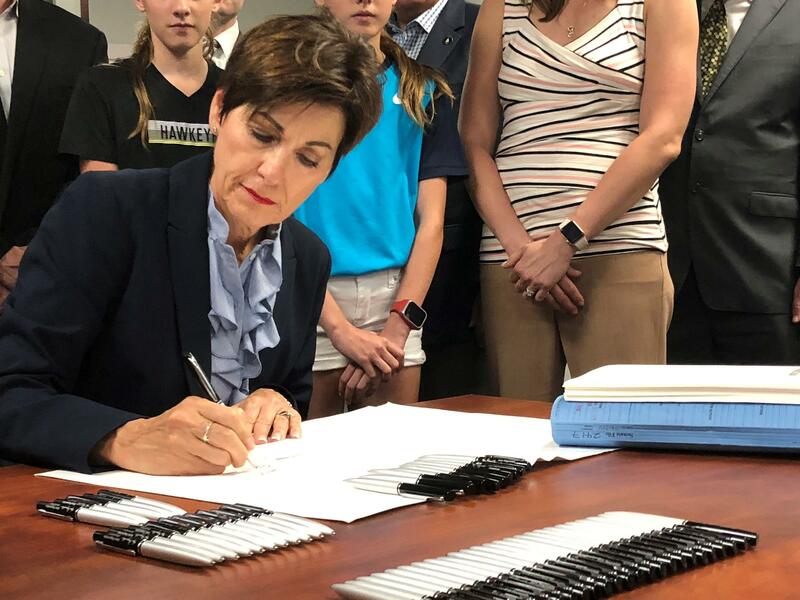 Governor Kim Reynolds signs into law SF 2417. Small business owners Aurora Moes and Matt Miller spoke in support of the tax overhaul. 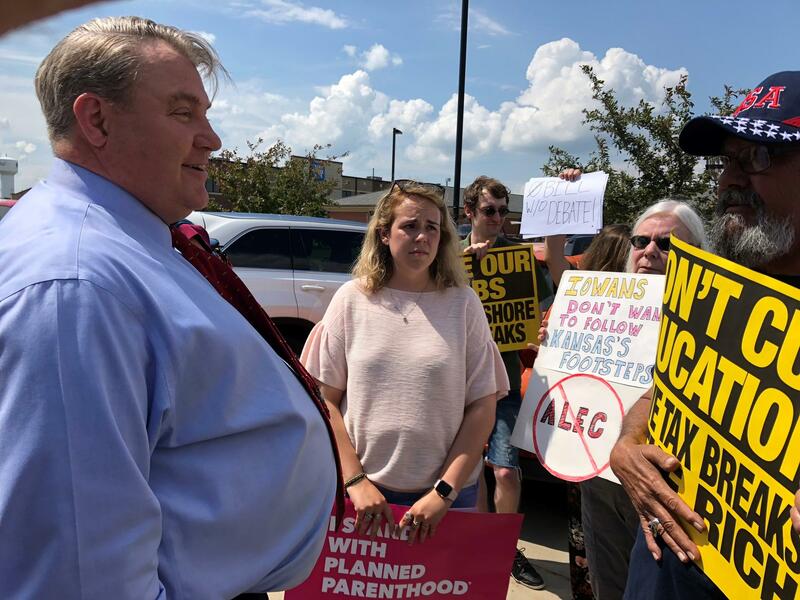 Matt Miller speaks with protestors outside his business MobileDemand, where the governor held a bill signing ceremony. Ashley Burns was one a handful of protestors outside of Wednesday's bill signing cermony. Gov. Reynolds signed the bill at tech company MobileDemand in Hiawatha Wednesday, surrounded by small business owners and supporters. 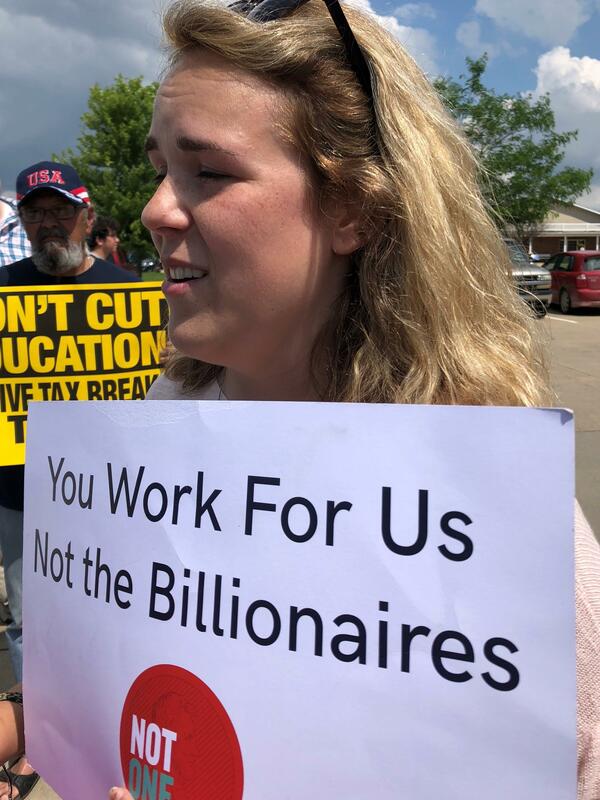 She said every extra dollar matters to Iowa families, and said businesses will be able to use their savings to hire more workers and raise wages. 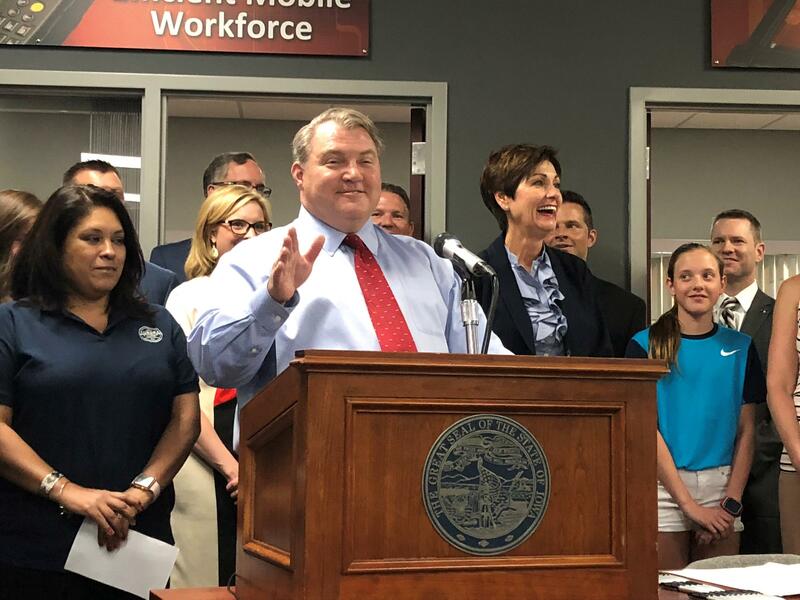 The plan cuts income taxes across all of the state’s tax brackets, saving Iowans an average of $300 per year, according to a state Department of Revenue analysis. Small business owner Aurora Moes spoke in support of the law. She runs the Aurora Coffee Company in Marion and said her tax burden has prevented her from raising wages for her employees. "For the people that have been with us for a year and a half, I would love to give them pay increases. But you know a lot of money goes back into taxes," she said. But Moes said now she'll be able to pass those tax benefits on to her workers. "This is gonna be nice, where my employees will actually see the effects of this as well. So I'm excited about that." But some Democratic lawmakers argue the cuts favor the wealthy, and will slice into a state budget they say isn’t keeping up with expenses. The top Democrat on the Iowa House Ways and Means Committee criticized the law Wednesday, saying it's a "tax scam" that will "make the state's budget crisis even worse." Representative Dave Jacoby released a written statement saying Iowans will have balance the cuts in other ways. "In order to pay for $483 million in new corporate tax giveaways, Republicans are actually raising taxes on everyday Iowans through higher property taxes, raising the sales tax, and increasing tuition at community colleges and state universities," Jacoby's statement read. Senate Democratic Leader Janet Petersen also blasted the plan, saying the tax overhaul will jeopardize government services that Iowans depend on. "The legislation being signed into law today is bursting with giveaways to millionaires, wealthy corporations and people who don’t live in Iowa," Petersen's statement read. “It will raise property taxes on Iowa families, seniors and small businesses; and it will result in deep, deep cuts to health care services, job creation and education, and public safety." Ashley Burns was one of handful of protestors who gathered outside of the governor's bill signing ceremony. She called the law a "scam" said she'd rather see the state invest more in human services. "We are trying really hard to advance this state," Burns said. "We're trying to bring more funding to education. We're trying to fund mental health. We're trying to fund oragniztons that deal with domestic violence and all of these hings. We just can't even afford our budget right now." Portions of the bill would only go into effect if state revenues are high enough to support it, which supporters call "guardrails" that ensure the changes are "fiscally responsible." Responding to critics of the bill, Reynolds said she didn't want to burden Iowa workers with more taxes. Reynolds said voters support the tax overhaul, which she calls historic. She hopes to ride that support into November, and keep her job as governor.